Elmar Lampson was born in 1952 in Koblenz and studied composition, music theory and violin at the music academies of Hannover and Würzburg. 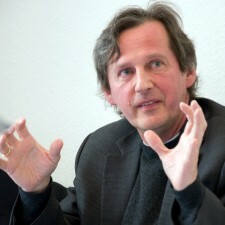 Until 2004 he lectured phenomenology of music at the University of Witten/Herdecke, served as dean of the faculty “Studium Fundamentale” and was member of the executive board. Today he is president of the University for Music and Drama of Hamburg and professor of composition and theory. As a composer and director he performed on international festivals and toured through nearly all European countries and many parts in Russia. He was frequently featured by radio- and TV broadcast during these concert tours. He recorded CD’s released by Sony Classical and col legno. Peermusic Germany publishes his catalogue as a composer including works for choir, orchestra, chamber music and opera. Lampson was co-founder of the annual festival “Hörwelten” – Hamburger Begegnung im Zeichen zeitgenössischer Musik (Hamburg contemporary classical music encounter) which run from 1989 to 1999. Since 2004 Lampson is president of the Hamburg University of Music and Theatre. Among his latest works are the Symphony No. 3 and the works Aquarell (for Vibraphone solo) and Chant (for Piano solo).